News in overnight from Cromwell Littlejohn at Merle Wood & Associates that his central listing, Broward's 31.09 motor yacht Liquidity, has had a price cut. Delivered in 1983, the luxury yacht accommodates eight guests in a full beam master, VIP and two twins and cruises at 18 knots. 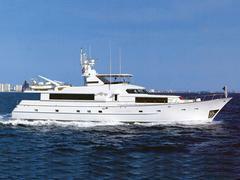 With a proven charter history behind her, Liquidity's price has dropped from $2.299 million to $1.695 million.